AFC Fylde have signed forward Jack Muldoon from National League champions Lincoln City. Muldoon joins the Coasters on a one-year deal after turning down a new contract at Sincil Bank. An experienced non-league campaigner, Muldoon made 66 appearances in the National League for Lincoln over two years, scoring 12 goals and helping the club to win promotion to the Football League last season. 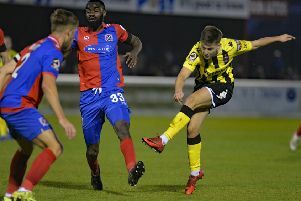 The 28-year-old takes Fylde’s number of summer recruits up to seven following the signings of Jordan Tunnicliffe, Lewis Montrose, Zaine Francis-Angol, Henry Jones, Jay Lynch and Josh Ezewele. Manager Dave Challinor said he was pleased to complete the deal following lengthy negotiations. Challinor said: “We’re really pleased to get this one through the door. This is a deal that’s been going on for quite a while. We spoke to Jack right at the end of last season and he had other options, so we had to work it out logistically in terms of where he was living and other things. “To get him in is great. His experience will be massively important and he’s come from a team that has just won this division. I’ve known him for a long time and know what he brings. He added: “I suppose Jack, didn’t play as much as he would have liked last season but he was part of a fantastic team that achieved an awful lo. I suppose his aim will be to be a regular in the team and show what he can do over the course of the season. “I’m absolutely convinced he can score goals and give us different options. He has a bit of everything – he can play with his back to goal, he’s strong, he’s quick and can get in behind. He can finish as well, so I’m sure he’ll be a really good asset for us. “We need strength right through. If you look at the very top level, they’ll have two players for each position. We don’t have the luxury of being able to do that but we need options.